Bog butter has graced the tables of ancient Ireland and Scotland for at least 3,500 years, a new study found. Samples of bog butter recovered from Irish bogs. Image credits Jessica Smyth et al., (2019), Scientific Reports. 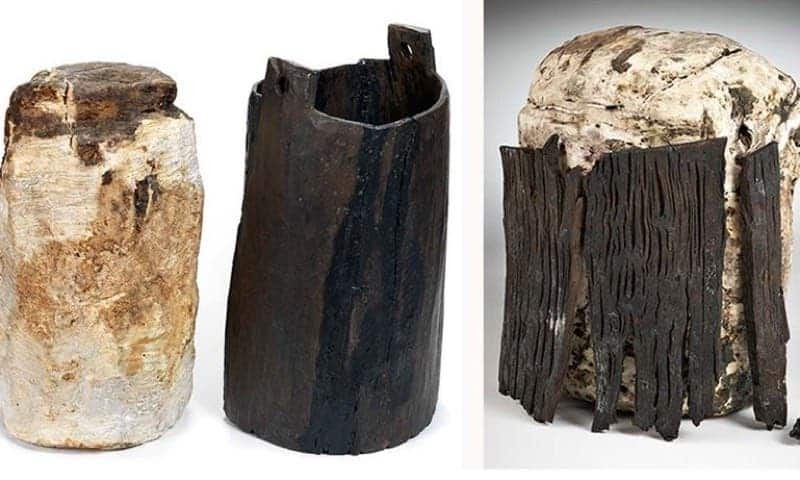 New research comes to shed light on the ancient practice of making “bog butter”, a product that delighted (and/or nauseated) ancient denizens of today’s Ireland and Scotland. The study, led by researchers from the University College Dublin, analyzed the chemistry of butter recovered from several sites in Ireland to find that it was a remarkably long-lived tradition. Bog butter is made, you won’t believe this, in bogs. Peat bogs, to be exact. It may sound like a particularly poor place to store your beloved butter, but the unique chemistry and microflora of these bogs are actually incredibly good at preventing spoilage — stashes of butter have been discovered still fresh after spending thousands of years in such bogs. However, that made the butter no less mysterious. For example, we didn’t know whether this was proper butter. Previous analyses were able to conclude that the butter was surely obtained from animal products, but they couldn’t determine whether it was composed of milk fats or animal adipose tissue — i.e. if these were stashes of animal fat obtained from meat or butter churned from dairy products. The team used radiocarbon dating and carbon isotope analysis to obtain conclusive evidence on the origin of this material, and find that the practice survived for at least 3,500 years in Ireland and Scotland. Some 430 stashes of bog butter have been found and recorded to date, 274 of them in these two countries. They’re usually stored in some kind of wooden container — buckets, kegs, barrels, etc. — or animal bladders. The team says they were buried as a means of preservation, as previous research has shown that meat stored in peat bogs for two years had roughly the same bacteria and pathogen levels as meat stored in a modern freezer. Another possible explanation is that this was a kind of food processing — i.e. that people at the time actually wanted their food to taste of peat. To each his own. The current study looked at stable carbon isotope ratios in the fatty acids of bog butter and compared that to a global database of animal fats in order to determine its origin. They report that 26 of the 32 samples they analyzed were definitely made from dairy, and a further three were very likely made from dairy. The other three samples yielded inconclusive results, they add. Radiocarbon dating showed that the samples date back to the Early Bronze Age, around 1700 BC. You’re probably wondering what the butter tastes like — me too. We’re in luck, as this delicacy has been recreated in modern times. A team of researchers led by Benjamin Reade from the Nordic Food Lab presented several samples of bog butter at the 2012 Oxford Symposium on Food and Cookery, for example. The butter was aged for three months underground (a second stash, not presented at the Symposium, has been aged for seven years) without going rancid. However, it wasn’t a smashing success, “causing disgust in some and enjoyment in others,” according to Reade. The paper “Four millennia of dairy surplus and deposition revealed through compound-specific stable isotope analysis and radiocarbon dating of Irish bog butters” has been published in the journal Scientific Reports.